The Flash #13 is an issue that I have personally been anticipating for many months. It marks the beginning of a story arc about Gorilla Grodd laying siege on Central City and The Flash that is simply titled – "Gorilla Warfare." Let that sink in for a while. One of the reasons that The Flash works so well, especially this run, is that it doesn’t shy away from the more ridiculous concepts that the character pertains to. In this case: talking gorillas from a secret jungle empire invading a city. Not only does it not shy away from these ideas, but also it instead embraces them. Takes them in stride, it’s what makes The Flash, well, The Flash. This issue does not fail to deliver on the promise of its concept one bit. It’s done entirely in a tongue-in-cheek manner with a wry sense of humor about the situation that has been imposed on the characters. This is not to imply that the story is wholly silly, there are real moments of tension and suspense. The stakes are frighteningly real for our hero as one particularly gruesome scene involving a notable character shows. The title might have a pun centered on them, but the Gorillas are playing hardball. Manapul and Buccellato have struck a balance between the inherent humor of the story, which gets a set piece or two, and the seriousness that it deserves. There is also mention of a sub-plot involving Danny West, a character introduced in last month’s Zero Issue and Iris’ brother, who has been said to play a big role in the rest of the story arc. While the gorillas might be getting top billing but what really steals the show are The Rogues. 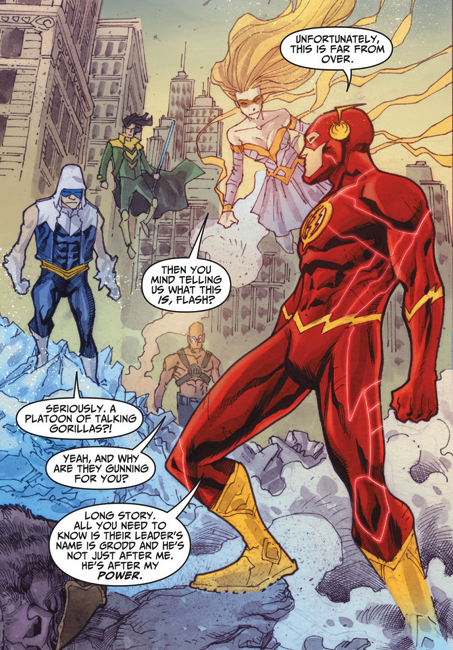 That they have been forced to team up with The Flash leads to an interesting dynamic, and one that fans are familiar with given that the enemies have been historically professional in their relationship. The best moments come from their interactions amongst each other and provide quite a few laughs. Manapul is back in the saddle on the art and it is readily apparent. The entire issue is littered with fantastic panel layouts and spreads. It’s amazing that he was able to find the time to produce as much on mark work as is on display here, aided evenly by Buccellato's coloring. That the rest of this story arc can possibly be on as equal a level as this chapter bodes well. Overall it was a great start to "Gorilla Warfare." The stakes our high, our hero is facing imminent threats, and it’s just an action packed issue. The only real fault is that it's another month before it continues, but seriously some of the dialogue does falter a bit in the middle but nothing too big. If the rest turns out to be as good then this is truly shaping up to be one of the great runs on the title.